The Annual Newman Lake Clean Up Day is Saturday, April 21 from 8 a.m. until approximately noon. Come to the old fire station (on West Newman Lake Drive just west of Starr Road) to pick up bags and gloves and chose a section of roadway to clean up, then join us back at the station for hot dogs afterwards. 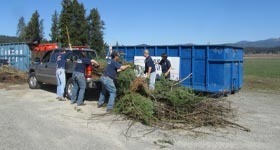 There will also be crews on-hand to take care of clean green that you wish to dispose of. As part of Newman Lake Clean Up Day, Saturday, April 21st, NLFR will be sponsoring FREE yard debris drop off again this year. Not accepted: branches over 3”x6’, soil, root balls, lumber, trash or commercial loads. Drop off between 8am and noon. We are happy to give the community this opportunity to clean up their property, making us all safer for summer fire season. 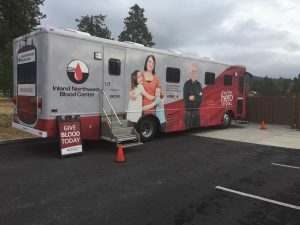 Also on Clean Up Day, Newman Lake Fire Auxiliary is sponsoring a blood drive. The Newman Lake Community always turns out for these; the Blood Mobile loves coming to see us. Our blood drive on January 6th netted 19 donations, especially important during the winter months when supplies are low. Blood Drive on April 21st, at the old fire station (10236 N West Newman Lake Drive), 9am-1pm. Call Linda Rivers to make your appointment. 509-991-7106.